Over time, Littlest Pet Shop pets give way to general wear and tear. Some sets in particular have shown problems as they age. 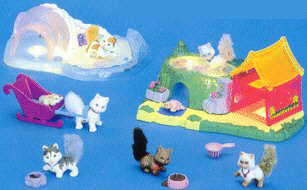 The Sparkling Pond Pets (1995) both contain thin plastic "ponds" that encase water and magnetized accessories. Even when stored properly, the water from these ponds sometimes has a tendency to leak out. The plugs on the bottoms of the ponds are covered in what appears to be a relatively cheap glue that naturally breaks down over time. Placing additional glue over this plug (photos coming soon) can help to prevent more water from leaking out but it's neither a permanent nor a restorative fix. One could attempt using glue solvent to remove the faulty glue, gain access to the plug, and refill the pond (leaving several air bubbles so that the accessories can still move). Often times, the best solution is to purchase another pond set on eBay. Several LPS sets require batteries: the Twinkling Sledding Party (1995), Water Garden Kitties (1995), and the Shamu Family Playset (1995). Many collectors have encountered problems with battery corrosion. The best way to prevent this problem from ever occurring is to simply remove all the batteries from your LPS sets when they are being stored. - Alkaline: Alkaline batteries contain potassium hydroxide, which can cause eye, skin, and respiratory irritation. Using protective gloves, dip a Q-Tip in vinegar or lemon juice and rub it on the soiled battery compartment. Be sure to clean the electrical contacts thoroughly with this solution. - Acid: Wearing protective gloves, dip a Q-Tip into a mixture of baking soda and water (about a 4:3 ratio). Use this solution to clean the battery compartment. Make sure to let the battery compartments dry thoroughly before using fresh batteries. Most LPS pets were made of a hard, hollow plastic. Other pets were made of a solid, rubbery-like plastic. The plastic from these latter pets often becomes tacky and sticks very slightly to whatever surface it's exposed, often times pulling up paint when it's removed. 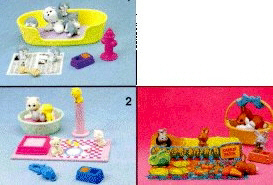 Several of the kittens, puppies, and bunnies from the Mommy & Babies sets (1992) exhibit this problem. To prevent this problem, you can store your rubbery pets separately and wrap each one in tissue paper. If you are displaying your LPS collection, placing a small piece of tissue paper underneath the problematic pet can help to keep it from sticking to any surfaces. Acrylic paint can be used for minor touch-ups where paint has flaked off. I recommend using Golden Fluid Acrylics mixed with Golden Acrylic Medium; the medium adds a touch of gloss and helps the paint to stay flexible and dry with a stronger finish. Sometimes purchases of Littlest Pet Shop items from eBay arrive with an unfortunate smoky smell that can be difficult to get rid of. 1. Mix 1/8 cup of vinegar into a 1/2 gallon of water and stir (vinegar helps to get rid of resin and tar, which are the causes of the smoky odor). 2. Let the toys soak in the solution for about ten minutes. 3. Rinse them in cold water and let dry. *Note: the vinegar smell will remain temporarily but will diminish quickly.